Paul was the one who was born out of time (1Cor 15:8), that is, after the 12 Apostles had received the Counsellor, the Spirit of Christ. He too, became a powerful teacher and a faithful servant of God. He wrote to the headquarters Church in Ephesus (the only one of the seven Churches to whom he wrote and for which the record remains), and spoke of the mystery that God was purposing in Christ. He said this mystery would be put into effect when the times had reached their fulfillment: Eph 1:9 "And He made known to us the mystery of His Will according to His good pleasure, which He purposed in Christ, to be put into effect when the times will have reached their fulfillment – to bring all things in heaven and on earth together under one head, even Christ." Well, the times have reached their fulfillment when the mystery of His Will will be put into effect. It was God’s Plan right from the beginning that the seven Churches would have a glorious role to play in bringing all things in heaven and earth together and under the mighty rule of Jesus Christ Himself. And this is precisely why Paul was writing to the Church in Ephesus. For He must reign until He puts everything under His feet (1Cor 15:25-27). So Paul was speaking of a future time, the fulfillment of all things. In other words, the fulfillment of all that is written, the Word of the prophets of God and all they recorded. He told the Church in Ephesus that they had been marked with a seal, a deposit or down-payment of the Holy Spirit: V13 "….Having believed, you were marked in Him with a seal, the promised Holy Spirit, who is a deposit guaranteeing our inheritance until the redemption of those who are God’s Possession – to the praise of His Glory." So even then, Paul was speaking of those who are God’s Possession who would come later, but before the return of the Mighty Christ. God has mentioned His Possession and calls them His Treasured Possession, and says ‘they will be mine’: Mal 3:16 "Then those who feared the LORD talked with each other, and the LORD listened and heard. A Scroll of Remembrance was written in His presence concerning those who feared the LORD and honoured His Name. "They will be mine," says the LORD Almighty, "in the day when I make up my Treasured Possession. I will spare them, just as in compassion a man spares his son who serves him. And you will see the distinction between the righteous and the wicked, between those who serve God and those who do not." Paul felt that it would be good if the Church in Ephesus had the full measure of God’s Holy Spirit rather than just a deposit or down-payment so that they could have the Spirit of Wisdom and Revelation and know God better. But it was not to be at that time: V17 "I keep asking that the God of our Lord Jesus Christ, the Glorious Father, may give you the Spirit of Wisdom and Revelation, so that you may know Him better." Even today, when the times have reached their fulfillment, they are never going to know the Father better until they learn to fear Him and honour His Name. God’s Treasured Possession not only fear the Father, but they honour His Name as a faithful son would. They take it very personal when lunatics and wannabees impeach the Father’s Name. It’s very clear that the Church in Ephesus was not God’s Treasured Possession. They will be in the future though, when they understand the Mystery of God’s Will, and join God’s Treasured Possession in the Kingdom of God. This will happen when God does give them the Spirit of Wisdom and Revelation. They certainly don’t have it at the present time! Mind you, it was God’s intention from the very beginning that they would have Spirit of Prophecy (Revelation) and Wisdom, and the time will come when the Wisdom of the ages is made known to them, but not until they have the full payment of God’s Holy Spirit. Paul made these things plain to everyone. Eph 3:9 "….and to make plain to everyone the Administration of this mystery, which for ages past was kept hidden in God, who created all things. His intent was that now, through the Church, the manifold Wisdom of God should be made known to the rulers and authorities in the heavenly realms, according to His eternal purpose which He accomplished in Christ Jesus our Lord." Without the full measure of God’s Holy Spirit they are never going to understand the Wisdom of God and Revelation, so there is little chance of ever making anything known to the rulers and authorities of the heavenly realms. Firstly, they don’t understand the administration of these rulers and authorities, and in some cases, are totally oblivious to their existence. So how are they ever going to understand the Administration of the Mystery that God is speaking of? Presently, the rulers and authorities of the heavenly realms have an administration that runs through every nation on earth, and is even lapping at the heels of God’s people Israel. Paul also mentions God’s Family: V14 "For this reason I kneel before the Father, from whom His whole Family in heaven and on earth derives its name." And what name is that? It’s the same name as the father of all 12 Tribes! His name was originally Jacob, but it was changed to Israel! God has made it very plain! Of all the families of the earth, God only chose those He led out of Egypt – the 12 Tribes of Israel (Amos 3:1-2). Remember Joseph’s dream about Jacob (Israel) being the sun, and his wife the moon, and his 12 sons the stars (planets)? So who was it that Jacob (Israel) represented? It was the Father, from whom he derived his name, and in whose Name all Israel are known. It’s clear that the Church is not going to be able to reveal anything to the rulers and authorities of the heavenly realms any time soon. Their teachings are so vague and incoherent, they really don’t understand anything! With all the manpower they’ve had over many decades now, they’ve utterly failed to put together any form of cohesive doctrine. They simply don’t have the Spirit of Wisdom and Revelation even today! The big problem is that they think they have! In the early days, even at Paul’s urging, God refused it. God planned only to give it to them when the times had reached their fulfillment, and even then, it would only come through God’s Treasured Possession. Even today, they base their ‘prophecies’ on some man either presently existing, or from history, whom they are sure is the beast. And what a tangled web they’ve weaved! I don’t know why they are so worried about the final beast! Most of the Church won’t even live to see him arise. Most of them will become disgruntled that God hasn’t lived up to their expectations and will curse Him and die. Of course, they say they would never do such a thing, but words are cheap. God has said they will (Isa 8:21-22). The silly part about all this is, that too many of these people don’t know the Holy Spirit within them has flamed out, and they now face the prospect of being thrust into utter darkness (V22), just as Jesus said in Matt 25:30. God’s Treasured Possession has the Spirit of Wisdom and Revelation because the Father has given it to them so they can understand the Father better. He is the one they fear and whose Name they honour. So those who have had their names recorded in the Book of Remembrance are a little bemused by the stupidity of those who think they understand these things. It’s one thing to get all lathered up about ‘giving your heart to the Lord’, as they love to do, but it’s an entirely different matter to ascribe the Mystery of His God’s Will to the stupidity they portray. God plans to create a whole new Administration of rulers and authorities, and the present rulers and authorities of the heavenly realms will have no part of it. Paul told the Church in Ephesus that they must no longer live as the Gentiles do. And what an indictment against the Churches today, who think they are Gentiles, and love to follow the way of the Gentiles. And this can, unfortunately, be a problem on all levels, with those so steeped in faulty Church teachings that they constantly carry the baggage of the Gentiles with them. Anyone who does this will never be God’s Treasured Possession, and they will never receive the Spirit of Wisdom and Prophecy. They will never grow spiritually! Paul speaks strongly of this: Eph 4:17 "So I tell you this, and insist on it in the Lord, that you must no longer live as the Gentiles do, in the futility of their thinking. They are darkened in their understanding and separated from the life of God because of the ignorance that is in them due to the hardening of their hearts. Having lost all sensitivity, they have given themselves over to sensuality so as to indulge in every kind of impurity, with a continual lust for more." Paul insisted on it because obviously some wanted to live as the Gentiles. What an affront to God that those who derive their name from the Father should want to live like His enemies! Apart from Paul’s description of Gentile behavior, and their futility of mind and wanton lust, which they can never get enough of, the Christ also adds a dimension to this understanding in Matt 20:25-28. Christ was speaking of those who wanted to be like the rulers of the Gentiles and absolutely forbad it! This doesn’t seem to worry the egotistical, power-mad brokers who want to be like the rulers of the Gentiles. But by their fruits you will know them! And they won’t be among the early figs that God craves. With a lot of prayer and fasting they may make it into the late crop. It’s such a detestable thing to God for His people to presume to live like the Gentiles. What could the Gentiles possibly impart to them that God has not already done? But on the question of righteousness and humility, we need only to turn to Paul’s example to the Ephesians as recorded in the Book of Acts. But first, let’s make the link between the administration of the rulers and authorities of the heavenly realms, of who they are, and how they are presently administering their evil. Paul made it plain that the power of the administration of these rulers and authorities is considerable, so much so, that it’s necessary to arm oneself against them. To the Church in Ephesus he wrote: Eph 6:10 "Finally, be strong in the Lord and in His Mighty Power. Put on the full armour of God so that you can take your stand against the devil’s schemes. For our struggle is not against flesh and blood, but against the rulers, against the authorities, against the powers of this dark world and against the spiritual forces of evil in the heavenly realms." So it’s against this administration that the Administration of the Mystery of God is at war, and will eventually replace. God’s Administration is going to crush the rulers and authorities of the heavenly realms and replace their authority. But by now, you should already know this (1Cor 15:24-26) provided you’ve been listening to God’s appointed messenger of the Covenant (Mal 2:4-7). Of course, if you disagree with this, then you need to mount some sort of defense. You could advise God that His messenger is a fool, and then claim the Matt 7:22 defense. It’s likely to be very popular. And if Almighty God is the fool you think He is, then the defense just might fly – and so might pigs! People who live like Gentiles become Satan’s Gentiles and a part of his administration. These are characterized by the futility of their thinking, their darkened understanding and their ignorance. And how ignorant they are! And they are constantly trying to enlighten others with their darkened understanding. They don’t care what God has to say on any matter, just as long as they gain support from men. And the only men who would give them support are those who are as ignorant as them. So the blind happily lead the blind. Paul stopped at Miletus in Asia Minor and sent for the elders of the Church in Ephesus. When they came he began to speak to them of the future, and to explain how they should conduct themselves. Everything Paul said to them would have very real ramifications when Jesus Christ delivered the Book of Revelation to John many years later. This Book contains the message for the Church of Ephesus as well as the other six. It was in this region, and in these seven Churches, that destiny was to be fulfilled. Paul had no illusions over what the future held. He himself was resigned to going to his death shortly after his final meeting with them. Acts 20:25 "Now I know that none of you among whom I have gone about preaching the Kingdom will ever see me again. Therefore, I declare to you today that I am innocent of the blood of all men. For I have not hesitated to proclaim to you the whole Will of God." These people in Asia Minor were not present at the terrible destruction of Jerusalem and the Temple, and they were relatively free of persecution. Not so with Paul. Even as he spoke to them, he knew that he was going to imprisonment and death (V23-24). Having warned them of what is to come, he declared that he was innocent of the blood of all men. All God’s true servants are innocent of the blood of all men. In fact, all Israel is innocent of the blood of all men when they go into battle against God’s enemies – the rulers and authorities of the heavenly realms. They are declared innocent by God Himself! Paul was making the point that he had told them everything they needed to know in order to be good overseers of God’s flock. I think we know who God’s flock is. Jesus formerly said He had come ‘only to the lost sheep of Israel’. This is why Paul told them to stop living like Gentiles. But they had another role to play; they had to be shepherds of the Church of God! This is what Paul said: V28 "Keep watch over yourselves and over all the flock of which the Holy Spirit has made you overseers. Be shepherds of the Church of God, which He bought with His own blood. I know that after I leave, savage wolves will come in among you and will not spare the flock. Even from your own number men will arise and distort the Truth in order to draw away disciples after them. So be on your guard! Remember that for three years I never stopped warning each of you night and day with tears." We’ll draw some parallels to what Paul said here, and what has happened in recent times as ‘the times have approached fulfillment’, but first let’s conclude on Paul’s final advice: V32 "Now I commit you to God and to the Word of His grace, which can build you up and give you an inheritance among all those who are sanctified." It’s easy to read over a verse like this and not pick up on the meaning. Remember Paul was speaking to the shepherds of the seven Churches of God in Asia Minor – the only Churches mentioned in the final Book of prophecy – the Book of Revelation. The Book of Revelation was written specifically for them! Paul tells them that the Word of God ‘can build you up’ and give them an inheritance with ….whom? All those who are sanctified! Yes, this is exactly what Paul was saying! And Paul’s final advice to these seven Churches is not what the Churches of God today want to hear! They totally disagree with what Paul says next: V23 "I have not coveted anyone’s silver or gold or clothing. You yourselves know that these hands of mine have supplied my needs and the needs of my companions. In everything I did, I showed you that by this kind of hard work we must help the weak, remembering the words the Lord Jesus Himself said: ‘It is more blessed to give than to receive.’" Working with their own hands to supply their own needs is not the kind of hard work that the shepherds of the Church of God would ever contemplate! They wanted all their needs supplied by others, and they wanted a lavish and opulent lifestyle, while they were free to do as they pleased. And to augment this, they collected God’s tithe, which they had no right to do! Paul didn’t do it! He worked with his own hands to supply himself and his companions. He also made it clear that it’s Levi who collects the tithe (Heb 7:9). So if the tithe (God’s Tithe – Mal 3:7-10) is not for providing a lavish lifestyle for the shepherds of the Churches of God, then what is it for? It’s to provide for the fulfillment of all things – the establishment of God’s Kingdom. It’s to provide for God’s storehouse. Jesus spoke of the Kingdom of God and the storehouse. In Matt 13:44-52 He spoke of the Kingdom of God and what it would be like. He concluded by saying this: V52 "He said to them, "Therefore every teacher of the Law who has been instructed about the Kingdom of Heaven is like the owner of a house who brings out of his storeroom new treasures as well as old." The teachers of the Law who have been instructed about the Kingdom will be just like the Owner of the House, the Father! And they, like the Father, will bring new treasures and well as old from His storehouse. These teachers of the Law will teach the Law of God’s servant Moses (Mal 4:4). And now back to what Paul said in Acts 20:28 about being overseers of God’s flock – ‘the lost sheep of Israel’. Feel free to correct me if I am wrong, but I haven’t seen any Church on the face of the earth that has endeavoured to take a message to the ‘lost sheep of Israel’ – except the Worldwide Church of God. They got hopelessly tangled up on prophetic details, but they clearly understood who the ‘lost sheep of Israel’ were. Whether rightly or wrongly, they nevertheless made it clear that God would deal with His people Israel, and finally settle them in the land that He gave to the Patriarchs and their descendants. They plainly spoke of the Millennium and the establishment of the Kingdom of God. They spoke of lions and lambs lying down together and a little child leading them (Isa 11:6-7). They were also well aware that the correct name for the Church was the Church of God – the only name mentioned by the Apostles. Not the Mormons, Roman Catholics, Baptists, and certainly not ‘Jehovah’s’ Witnesses, but only the Church of God. It was beyond this that the wheels began to fall off, when they descended into fanciful prophetic theories. It was just like Paul said, Acts 20:30 "Even from among your own number men will arise and distort the Truth in order to draw disciples after them." This certainly happened in this time of fulfillment of all things. There has been a great falling away, and the Church is decimated. It should come as no surprise that the Church of God arose from among the ‘lost sheep of Israel’ far from the Holy Land and the Holy City. The ‘lost sheep of Israel’ have no intentions of every returning to live in the Holy Land; they’re quite happy where they are! Oddly enough, God speaks of a big rift developing between Judah and Israel (Zech 11:14), and a later time when the breach would be healed (Eze 37:15-17). And this breach will be literally healed with fire, amid massive conflagrations – and the establishment of God’s Kingdom on earth. It was God’s intention that the through the Church, the manifold Wisdom of God should be made known to the rulers and authorities in the heavenly realms – according to God’s Eternal Purpose (Eph 3:10 again), but this hasn’t happened. But God’s Eternal Purpose still stands. God laid the groundwork long ago when He announced that He would raise up a shepherd for this purpose. When God speaks of him, He is not predicting failure but success! A quick reading of what God has said would indicate a futile act – one doomed to failure. If this were the case, then it would seem pointless to mention it. It certainly provides a dilemma. In view of what God says about him, should we love him? Or should we agree with God and recognize the faults, which God identifies, and hate him? Well, first let’s find out what God says about the shepherd He Himself raises up. He instructed the prophet to act out a parable concerning him: Zech 11:15 "Then the LORD said to me, "Take again the equipment of a foolish shepherd. For I am going to raise up a shepherd over the land who will not care for the lost, or seek the young, or heal the injured, or feed the healthy, but will eat the meat of the choice sheep, tearing off their hoofs. Woe to the worthless shepherd, who deserts the flock! May the sword strike his arm and his right eye! May his arm be completely withered, his right eye totally blinded!" The identity of this shepherd is covered extensively in other articles. Suffice it to say, that he called himself Armstrong (because that was his name); God refers to his arm as being weak and withered – that is, no longer strong. He was also blind in his right eye. Most importantly, God Himself raised him up as a shepherd over the land. As it turned out, he was a shepherd over the Church of God, and the only shepherd specifically appointed by God over the land. He fell way short of making known the manifold Wisdom of God to the rulers and authorities of the heavenly realms – but not entirely. He did teach that Satan would be bound for a thousand years, and that the Kingdom of God would replace his rule on earth. But because of his fanciful ‘prophecies’ the rulers and authorities dismissed him entirely. Satan and his demon rulers knew who they were raising up to sweep across the whole world to destroy the whole House of Israel, and they were bemused by the fanciful theories of the false prophets. In fact, men like Armstrong were doing Satan a big favour. They were busily directing everyone’s attention to God’s own people, the remnant of ‘the lost sheep of Israel’ in Europe, and trying to convince everyone that they were Satan’s representative – the beast! The whole theory was crazy, and especially since they knew that the Western Europeans were the ‘lost sheep of Israel’ – and they actually taught this! But they were totally convinced that the only family that God ever chose out of all the families of the earth (Amos 3:1-2) would attack all of Satan’s families, and they seemed to believe that God had sent them to warn Satan’s brood of this coming slaughter. Satan couldn’t have hoped for anything better! They were teaching that the House of Israel was God’s enemy and that Satan’s brood were the innocent victims. Satan doesn’t understand prophecy. It takes a double-portion of God’s Holy Spirit to understand it, and he doesn’t have God’s Holy Spirit at all! He lost it long ago when he ceased to be the light-bringer. But neither is he entirely stupid. He knows that God planned to raise up a prophet from the House of Levi just like John the Baptist. He also knows that the great rescue would be conducted with Judah as a mighty force. At the time of Moses, he decided to kill all children to prevent Moses from arising. He failed. Later, he sought to kill all the children in the Holy Land to prevent the birth of Christ. He again failed. As his six thousand years wound down, he again sought to kill everyone that might sire a Levite prophet – the Elijah who was to come. He gathered his forces and threw everything at France and Britain – the heartland of the Levite Celts. He wanted to erase the Jews from the face of the earth. He conspired to draw Japan into an attack on the U.S. and to drive hard towards Australia. But again he failed. During this conflict, he had hoped that Europe would self-destruct and enable Moslem hordes to sweep into the vacuum and eventually finish the job. But nothing went according to his plan. And now he knows who Ephraim is, and to his horror, they have emerged as the only super-power on earth. Satan’s forces are ready to sweep across the whole earth and destroy every Israelite, with particular emphasis on Americans and Jews. His brood worship him as Allah, and are prepared to give their lives for him, presumably on the assumption that when he conquers heaven, they will have a place there. Conquering heaven is not an option that he takes lightly. He knows that God has said His mighty commanders are too strong for him (Rev 12:8), but he has also reasoned that America is too strong for him, but still he succeeded in terrorizing them with a preemptive strike, so he’s figured that a preemptive strike against God might work. With the power of the Glory behind him, nothing could stand in his way. With that sort of firepower, the House of Israel would be reduced to ashes in no time, and he would have absolute rule. This is the problem of those with inferior intellect! If he did achieve these goals (which he won’t! ), what would he do then? God the Father alone is immortal! If He removed His Spirit, which controls the entire creation, everyone and everything would perish together. God knows that excessive ambition has no bounds. All those obsessed with power soon find they lack the ability to think clearly. Satan, like all magicians, believes that he will be able to discover the source of God’s Great Power and immortality. It could be as simple as that of Sampson strength, or something similar, but he’s sure he’ll discover it! He now realizes he has nothing to lose by staging a coup against his own Father. In the human realm, this has been done plenty of times before. He’s set to become a filthy dreamer when he attacks his Father, and when he is cast back to earth, this is exactly what he will be! His dreams will be shattered and so will his forces of the air. He’ll be marooned on earth, and will set out to do astounding damage to the earth and its inhabitants (Rev 12:12). Of particular interest here, are those he will target. His blind fury will be against the woman that gave birth to the male child (Rev 12:13), which just happens to be the House of David. Christ was the Son of David. The House of David is described in Zech 12:10-14, and is made up of the offspring of David and the House of Levi. If you study the Scriptures, you will also find that one of Mary’s parents was a Levite. So Jesus was not only of the House of David, but also of the House of Levi. Collectively, God calls both Houses the House of David. So this is one group that Satan will attack, but to not avail. But it’s the other group, who obey the Commandments of God and hold to the Testimony of Jesus, that will be targeted with absolute fury. Since the whole Book of Revelation is for the seven Churches of God, we don’t have to guess to whom this is referring. And neither is this speaking of all the seven Churches, but only a small – very small – portion of them. These will be the ones who can be built up (as Paul put it – Acts 20:32) and receive an inheritance among all those who are sanctified. Those who are sanctified are the Sons of Jerusalem – those who are taught by God, and those who are recorded in the Book of Remembrance. These are the ones who have been purified like silver and gold (Mal 3:3). So it’s bad luck for all the wannabees. If you don’t believe God in everything He has said, then you are nothing at all! It’s almost time for the ‘woman’ to depart, and to prepare for the Kingdom of God. God always intended for this part of the work to be short. It was to prepare a people for God, who in turn would prepare the whole House of Israel for God. And the woman’s offspring are the Church. They too, will beat the nations with a rod of iron – eventually! This is what God planned before the very creation of the earth. Paul mentions it: Eph 1:4 "For He chose us in Him before the creation of the world to be holy and blameless in His sight. In love He predestined us to be adopted as His sons through Jesus Christ, in accordance with His pleasure and will – to the praise of His glorious grace, which He has freely given us in the One He loves." You are not holy if you don’t obey God’s Laws. And those who say you must not obey God’s Laws because you can’t do it perfectly are not holy either. If you obey God’s Law then you will be holy, and what is more, you will be blameless! Then you will be adopted as His sons. These are the adopted offspring of Jesus. And it’s worth noting (and studying) what Jesus said in Rev 22:16 concerning the Root and Offspring of David and the Churches of God. It’s all about to come together in one final tumultuous conclusion. What God planned before the creation of the world will come to a conclusion in Asia Minor, in the seven Churches of God. God has said that He will settle the whole House of Israel in the Holy Land that He gave to the Patriarchs. Apart from the Jewish people, none of the Tribes of Israel have any desire to live there. Most of them see the Holy Land as the last place they would want to live! They love the immensity of all they have built in their present countries, and the Promised Land holds no appeal. God has said He will bring them back and settle them there, and there they will have peace – a millennium of peace and rest. Well, no-one believes it! The House of Israel reasons that no-one in their right mind would want to live there. Some have even suggested that the Israelis should hand it over to the Moslems and call it quits. It’s just not worth the hassle. 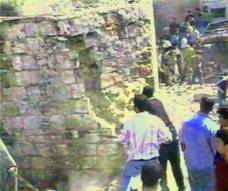 Joseph’s tomb is desecrated in Nablus. It shows the hostility of Satan’s hordes against the people of God and the tomb of a prophet of God no less! In your judgment, do these people deserve to die for this vile act of treachery and desecration? God’s judgment is yes! Ariel Sharon on the Temple Mount. Where are the 1,000 soldiers that lying Moslems said were with him? The U.S. State Dept. believed this to be a provocative act against Palestinians. But the desecration of Joseph’s tomb was not a provocative act and didn’t rate a mention – in their view! 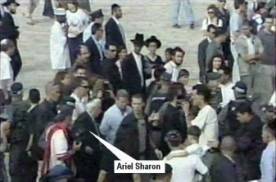 In complete contrast, the Palestinians went berserk when Ariel Sharon walked on the Temple Mount. The Palestinians immediately announce a jihad against the Israelis and the Americans. All Islam took up the call, and this triggered a round of hatred that resulted in the September 11 bombings. All Moslem nations used this as a pretext to hate the Israelis and Americans, and to take the fight to global dimensions. Satan’s been hard at work too. He’s been trying to convince everyone that the Moslems jihads are because the Israelis are occupying ‘their’ land. He’s been trying to convince everyone that if the Israelis no longer occupied ‘their’ land, then peace would ensue. Numerous attempts have been made to reduce the size of God’s Land in favour of the Moslems (as if the Moslems don’t already have enough land!) and squeeze the Israelis right out. Even Clinton favoured the repatriation of millions of Palestinians back to the Holy Land giving them political supremacy at the ballot box. He apparently wanted Yasser Arafat to rule over the Israelis and the Holy Land. This is typical of the shallow thinking of the looney left-wing of politics. God’s ways may seem mysterious to some who have been brainwashed to believe that God should act according to their view of things. They should surely know what God’s objectives are, but they disagree with His methods for achieving them. Their view of the prophecies of the Bible is that they are bizarre, and have no place in the modern perceptions of anything. They view their objectives as achieving peace with recalcitrant nations, while Bible prophecy speaks of wars. Well, Almighty God deliberately cloaked Bible prophecy in mystery and hid the meaning so no-one would understand – except those whom He has especially equipped to understand. He has made it clear that it requires a double-portion of His Holy Spirit to understand. Those who embark on a course of understanding must believe everything He has said. What is not understood must be believed as an article of faith. God has spoken clearly of this mystery: Rev 10:5 "Then the angel I had seen standing on the sea and on the land raised his right hand to heaven. And he swore by Him who lives for ever and ever, who created the heavens and all that is in them, the earth and all that is in it, and said, "There will be no more delay! But in the days when the seventh angel is about to sound his trumpet, the Mystery of God will be accomplished, just as He announced to His servants the prophets." So there is a Mystery of God! A mystery is something that no-one understands. God intends to reveal this mystery to His servants the prophets before it’s accomplished. The Mystery of God is something that He has withheld from human understanding – something that He had to reveal in order for it to be understood. At the time of the sounding of the trumpet by the seventh angel it will all be over and completed. Does this mean that peace will then descend on all the earth? Not at all! But it will descend on the Holy Land, and the people of God will know real peace! Presently, every honest broker knows that peace is unattainable with Moslem swine. They want the Holy Land and they can’t have it! They know very well to whom God gave it, but they are determined to thwart God’s intentions and bring all His promises to nothing. They believe that if they can thwart God’s plans, then they will prolong their rulership on earth. The rulers of the heavenly realms know that if God’s Great Plan were implemented, then the ones who surround the Holy Land are going to be displaced or slaughtered. So it’s all or nothing! They would rather see the whole earth destroyed than to concede their dominating power on earth to the Almighty God. God’s overall Plan is clear and uncompromising! The House of Israel will live in the land that God gave to His friend Abraham and his descendants, and the holy line was through Isaac and Jacob. Almighty God was careful to point out that as the House of Israel expanded in numbers, other nations would be pushed to the outer perimeter of the landmass. God will honour those who honour Him, those who don’t will be exterminated – and justice will be swift. Just as surely, God has decreed that those who traditionally worship the dragon will increase in numbers far away from the Holy Land. Many centuries after God has established the House of Israel, the dragon-worshippers will again arise, intent on conquest once more. Their leader will be Satan the devil, but this time he will be a man. God has made it clear that just as His Faithful Son Jesus was born as a man, so will His other rebellious son Satan. But whereas Jesus believed God would raise Him from the dead to life-everlasting, Satan will have no such expectation, and neither will it happen. Almighty God is the giver of life, and just as assuredly He can take it away. Those He loves He will raise from the dead. Those whom He despises will remain dead forever. God intends that rebellion will never arise again! Which rebellion is this? Is God concerned about human rebellion? Just bear in mind that the whole of humanity has been in rebellion against God from earliest times. It’s probably a good time to revisit the reason why the Son of Man came – to destroy the devil’s work: 1John 3:7 "Dear children, do not let anyone lead you astray. He who does what is right is righteous, just as He is righteous. He who does what is sinful is of the devil, because the devil has been sinning from the beginning. The reason why the Son of God appeared was to destroy the devil’s work. No-one who is born of God will continue to sin, because God’s Seed remains in him; he cannot go on sinning because he is born of God. This is how we know who the children of God are and who the children of the devil are: Anyone who does not do what is right is not a child of God; neither is anyone who does not love his brother." So we begin to see that those who love and serve God are His children and are a part of His family. It’s these who will bear God’s Name as children born of God. God is a creator and He loves to give life to all He creates. Human beings, being intelligent beings, also like to give life. Under proper circumstances, when babies are born there is great rejoicing. God didn’t create the earth to be uninhabited. He created a whole ecological system to be perfect and functional with a great variety of life-forms. He made mankind as male and female for the purpose of bonding them into family units from which would emerge a form of godly love. He enabled them to reproduce themselves. Just as surely, God recreated Himself when He made man in His own image. His purpose was to produce offspring who would inherit all that God has created. In order to inherit the family fortune, each must be the offspring of God. We all know that if we are born of a man and a woman, then we are sons or daughters of that union. Yet we have the ability to be born of God provided we do what is right and refuse the ‘pleasures’ of sin! And just to be sure that everyone understood what is right, John tells us in the same chapter: 1John 3:4 "Everyone who sins breaks the Law; in fact, sin is lawlessness." In the same theme, John went even further in 1John 5:18 "We know that anyone who is born of God does not continue to sin; the One who was born of God keeps him safe, and the evil one does not touch him. We know that we are children of God, and that the whole world is under the control of the evil one. We know also that the Son of God has come and has given us understanding, so that we may know Him who is true. And we are in Him who is true – even in His Son Jesus Christ. He is the true God and eternal life. Dear children, keep yourselves from idols." The evil one continues to assure those under his control that God is not creating a family of human beings. Those under Satan’s control continue to refute any suggestion of being born to the Father and becoming His children – and part of His family. The strange part of all this is that these same people refer to God as the Father, and claim to be the children of God – yet they turn into savages at the mere suggestion that God is creating His Family. Such people certainly identify whose children they are. They are not God’s – but the children of the devil. If there is a clear message in the Bible, it is that God is creating a family of sons and daughters. And the reason why God is doing this is linked to the reason why Christ came – to destroy the devil’s work and the children of the devil. And John makes a clear distinction between those who are born of God who are God’s children, and the children of the devil. In every circumstance, when men decide to form God in their own image, and develop a doctrine that is acceptable to them, they fall into the trap laid by Satan himself. You will note that John said that the One who are born of God keeps His people safe and the evil one does not touch them. There is nothing noble or virtuous about this on Satan’s part! Satan doesn’t touch them because he’s afraid of the consequences. He knows that he could be scooped up and imprisoned for a thousand years at any time of God’s choosing, and he knows that he must be very circumspect in all that he does. But he also knows that those who obey God totally, and without reserve, are God’s children! And like himself, these people are gods – just as Christ confirmed! Satan is also well aware that these sons of God will be called by God’s own Name. As members of the God Family Name, these people will be given rule over all that exists – including Satan and his brood. They will have power to judge, and to bring judgment down on anyone they wish. And of course, they will judge angels. Satan knows he has had six thousand years to do his work! He has failed to achieve what he had hoped for – the total destruction of all those who would one day judge him and send him to his eternal death. He, like all Bible students, knows that of all the families on the face of the earth, God only chose the 12 Tribes of Israel as His own (Amos 3:1-2). If Satan had been able, he would have destroyed the whole House of Israel from the face of the earth. Had he achieved this, then God’s whole Plan would have failed. God’s whole future family would have ceased to exist. Throughout all human history, the devil plotted and schemed to achieve these objectives, yet failed miserably at every turn in the road. God’s mighty hand was always upraised to prevent the total destruction of His people Israel. Yet the House of Israel was not immune from God’s displeasure when they turned against Him! Being the only family of all the families on the face of the earth who are God’s, does not entitle anyone to violate God’s Law. The House of Israel has been slow to learn this lesson! They turned back to God in desperate times, but soon forgot all about Him in times of prosperity and affluence. Nothing has changed! Jesus usually referred to Himself as the ‘Son of Man’ prior to His resurrection from the dead. He had a reason for doing this. He wanted to make it clear that those who are faithful, even in death, would take on the Godly dimensions of the spirit world, and God is a Spirit. Except in the most exceptional of circumstances (such as when the Holy Spirit appeared like a dove after Christ’s baptism), no human can see the Spirit of God. At the time of the great flood, Noah was busy building an ark, knowing that on its completion every man, woman and child on earth would be put to death. Now Noah was a preacher of righteousness, and was well aware that righteousness comes only from God. Did he bemoan the ensuing destruction that would soon cascade down on all of humanity around him? If he had done this, then he would be at odds with the intent of the Almighty God. Righteousness embodies justice and fairness, and these are the characteristics of Almighty God – and Noah knew it! A major part of the Great Plan of God is to lay the foundations of righteousness, and to use men who fully concur with all that God has said, and all that He intends to do. There are major differences between those who claim to be righteous, and those who actually are, and Almighty God is about to make a clear distinction in this regard. Long ago, He foreshadowed it when He announced that He would purify the Levites to perform tasks of righteousness. He empowered His servant and made it clear that he is to be listened to. This was probably true even in the days of Noah, but it seems no-one would listen to Noah, and inevitably, they suffered the consequences of their lack of judgment. Why did God conceal His Truth so no-one would understand? It would seem logical, humanly speaking, to make everything very clear if it were God’s intent to convert everyone. Instead, in the very chapter where John the Baptist began his ministry, we find that God detests the bulk of mankind: Isa 40:17 "Before Him all the nations are as nothing; they are regarded by Him as worthless and less than nothing." It doesn’t appear as if this is what the shepherds are presently teaching! Those whom God considers His enemies are regarded by most Christians as their friends. How could they be at such odds with God? How could they not know that God is going to destroy all His enemies? As Christians, shouldn’t they be aware of God’s intentions? Don’t they understand that the Mighty Son of God, the Christ, is a great warrior? Don’t they know that the Mighty Christ is going to destroy all the enemies of God before He hands the Kingdom of God to God the Father? They keep talking of the ‘end’. What ‘end’? The end comes when Christ hands the Kingdom to the Father, and many things will happen in the interim: 1Cor 15:24 "Then the end will come, when He hands over the Kingdom to God the Father after He has destroyed all dominion, authority and power. For He must reign until He has put all His enemies under His feet." The question remains: Why did God conceal His Truth? He did it so that no-one would understand His Truth. …except those to whom He chose to reveal it! Without the Spirit of God no-one can understand the message; and the ultimate message is the overall Plan of God. God appointed a messenger that would precede the arrival of the Mighty Warrior – the Christ! God was careful to declare that Levi is the messenger of God (Mal 2:7). He was also careful to declare that Levi would have many brothers and sisters, and facilitated this by refining them in a Godly manner (Mal 3:3). What typifies the Levites is that they talk with one another and love one another, and are prepared to die for one another. They’ve divested themselves of lying deceit and arrogance, and God has recorded their names in the Book of Remembrance. Now God’s words in the Book of Malachi are so plain that even someone with the slightest flicker of God’s Spirit still burning within them will understand. Sadly, many in the Churches of God have quenched the Holy Spirit and are marooned in spiritual exile. And they’ve done it to themselves! It would have been better for them to have never had the Holy Spirit than to turn away like dogs to their vomit. In teaching their lies, they have brought great discredit to the glorious Name of the Father. When did God ever suggest that anyone other than His messenger would prepare the way for the Mighty Christ? We have the former example of John the Baptist who fulfilled this role at the first appearance of Christ. The angel of the Lord told John’s father Zechariah that John would fulfill the role of Elijah (Luke 1:11-17). And he certainly did it, yet in a limited way before the ruler of the heavenly realms – Herod – beheaded him just a few months later. And prior to the birth of Christ some six months later (John was born in March before the Passover of that year, and six months before the Christ), Zechariah was filled with the Holy Spirit and began to prophesy concerning his son John. What is interesting about Zechariah’s prophecy is that it was not fulfilled in total during the life of John. Zechariah spoke of ‘salvation from our enemies’, but neither John nor Christ were saved from their enemies at that time. Both were killed by the Herodian line of murderers. This is what Zechariah prophesied: Luke 1:68 "Praise be to the Lord, the God of Israel, because He has come and redeemed His people. He has raised up a horn of salvation for us in the House of His servant David (as He said through the holy prophets of long ago), salvation from our enemies and from the hand of all who hate us – to show mercy to our fathers and to remember His Holy Covenant, the oath He swore to our father Abraham: to rescue us from the hand of our enemies, and to enable us to serve Him without fear in holiness and righteousness before Him all our days. And you, my child, will be called a prophet of the Most High; for you will go on before the Lord to prepare the way for Him, to give His people the knowledge of salvation through the forgiveness of their sins because of the tender mercy of our God, by which the RISING SUN will come to us from heaven to shine on those living in darkness and in the shadow of death, to guide our feet into the path of peace." It soon became obvious that the House of Israel did not receive salvation from their enemies at that time. Even the Church that Christ built was not exempt from persecution and death from their enemies. Instead, their enemies came at them with murderous resolve. Like many of the prophecies of the Bible, they were only partially fulfilled at the time of writing. Yet all prophecy points to calamitous events in the endtime when the Mighty Christ arises to act. Then the House of Israel will be rescued from the hand of their enemies, but all this will occur after the House of David is restored by John’s endtime counterpart – the Elijah, who will restore all Truth and prepare a people for God. Unless you are living in some sort of twilight zone, you will realize that the House of Israel has not been rescued from the hands of their enemies. They haven’t even fallen into the hand of their enemies – yet! Sure there’s been some self-proclaimed ‘prophets’ who have claimed the British crown as the House or throne of David, but their reasoning is absolutely farcical and bordering on madness! Did John the Baptist establish the House of Windsor (which they call the House or Throne of David)? The throne of England has been established for centuries; could any Elijah establish a throne that already exists? If it really is the House of David, then it’s already done. The ‘holy prophets of long ago’ never described the throne of England! Christ is not going to sit on a throne in England, He’s going to sit on a throne in Jerusalem! God has said that David would never want for a man to sit on His throne, and this is true! God preserved the line of David in order that David’s descendants would continue to exist. Jesus Christ is living proof of this! God has spoken of David’s descendants, and confirmed that the House of David will be established in Jerusalem. Not your average, mealy-mouthed weaklings, but men of strong character and determination. As in the days of Moses, a powerful body of men and women will be called to duty, to rescue the House of Israel from their enemies. These are the Levites who prepare the way for the Mighty Christ. These are warrior-class beings – the ones of whom Christ said, "If my Kingdom were of this age, then would my servants fight" (John 18:36), and like David, the faithful servant of God, these will fight! Yet not with conventional weapons – but with the weapons of God! These people will be the embryos of the ‘armies of the Living God’ and will function as the ‘Chariots of Israel’! Christ’s servants are the people of Jerusalem. God plans to give them this City – the Holy City of God. And these people will be called the Sons of Jerusalem. These people are unique, in that they fear God more than anything on earth, and they honour and revere their Great Creator! God says of them: Mal 3:16 "….A scroll of remembrance was written in His presence concerning those who feared the LORD and honoured His Name. "They will be mine," says the LORD Almighty, "in the day when I make up my treasured possession. I will spare them, just as in compassion a man spares his son who serves him. And you will again see the distinction between the righteous and the wicked, between those who serve God and those who do not." You may think you serve God and that ‘all is well with your soul’ (as the old song goes), but unless you revere and fear God and stand in awe of His Name, your service is shallow. The time has come for people to again see the type of Godliness that existed among the true servants of God. There are many examples in the Bible. We have the example of faithful Abraham who rode out with 318 men against overwhelming odds and returned victorious to be blessed by the Mighty Christ Himself – the Prince of Peace. We have the example of David who was fearless in the face of a giant who was feared by all. When David expressed his concern for the reticence of the whole House of Israel to engage him, he was castigated even by his own brothers. David was outraged that the House of Israel should fear such an opponent, and exclaimed, "Who is this Philistine dog that stands against the armies of the Living God?" David had already been anointed by the Levite prophet Samuel, to be king of Israel, and was filled with God’s Holy Spirit. In David’s mind, it was unthinkable to allow the situation to continue. Since no-one else would slay this beast, David himself strode out on to the field of battle armed only with a slingshot. In David’s mind, the victory was God’s, and he took the least of all weapons in order to enforce this fact on all those who saw it. Not all men are men of courage! Not all men are fit and capable of battle, and David certainly wasn’t battle-hardened and trained. He was a young lad, but one of exceptional courage. He stood his ground in the face of the enemy! And when God says you will again see the distinction between the righteous and the wicked, He is foreshadowing a time of men of courage who fear God more than their own lives. The man Jesus was such a man. He is the greatest warrior of all time, and the Invincible One. All power has been put into His hands to do what He must do – to crush the rulers of the heavenly realms and reduce them to ashes. Yet before all this, it was necessary for Him to set the ultimate example of courage. This culminated in His arrest and death. Of great interest is the account of His arrest. A mob, together with a detachment of armed soldiers, arrived to arrest Him. Jesus took the initiative and stepped forward and asked what they wanted (even though He already knew). When they said, "Jesus of Nazareth", He replied, "I am He". What happened next is absolutely classical. The mob, including the armed soldiers, drew back and fell to the ground (John 18:6). The boldness of Jesus, together with the invocation of the Holy Name ‘I AM’ struck fear into them, and they crumpled into a pile. Jesus had to literally induce them to step forward and arrest Him. Even when Peter stepped forward and sliced off Malchus’ ear, none drew their swords for combat. They were all but paralyzed with fear. They couldn’t believe their luck when Jesus went quietly like a Lamb. Then desperation set in, and madness prevailed. Satan himself was there; he got the ball rolling by entering into Judas. Later, when Satan abandoned him, he came to the awful realization of what he had done and killed himself. (Like Nebuchnezzar, he had his sanity restored and could see clearly what he had done, but unlike Nebuchadnezzar, for Judas it was too late!) Satan knew what was in his own mind, but now he had to induce the same murderous resolve into the mob and all who would fulfill his will. With the aid of his lieutenants, mindless madness prevailed, and he whipped them into a frenzy. The bizarre part of all this is that Satan was determined not to kill Christ personally, but to induce His own people to do it. Unbeknown to him, this is precisely what was prophesied to happen. In his muddled, incoherent mind, he did exactly what God intended. Well, we all know what happened, and we all know of the speed and efficiency of how it was carried out. And so occurred the greatest Sacrifice of all, and Christianity is fully convinced of the need for it. They understand that the shedding of blood is necessary for their salvation. But that’s all they do understand! They seem to understand that the sacrifice of lambs every year on the Passover pointed to the ultimate sacrifice, but they fail to see that God commanded bulls and rams, goats and doves to be sacrificed also. In their muddled minds, all these things are inconsequential to their salvation. Of course, if this were true, then prophecy would be of no importance at all. In their view, prophecy is of no importance, and God made a strategic mistake in delivering the Book of Revelation many years after that great Sacrifice in 30 AD. While mainstream Christianity generally neglects (or rejects) the Old Testament in favour of the New Testament, they can’t ignore the obvious references to the Nevi’im – the former prophets. It’s quite a dilemma for them! They build their booby-traps for the unwitting with such expressions as ‘it may mean…’ or ‘it could mean…’ or ‘this or that may happen…’ but they are not really sure! But they feel obligated to appear prophet-like, and create the illusion they know what they are talking about. They feel certain that if they release enough ‘prophecies’, even though many of their own ‘prophecies’ contradict each other, one or two of them may eventually come true. To enhance their stature, they even tell stories they have made up, just as they did in Peter’s day (2Pet 2:3). It’s interesting that these false prophets all seem to do this, particularly since Peter mentions in this same Book, their condemnation, their swift destruction: 2Pet 1:19 "And we have the word of the prophets made more certain, and you will do well to pay attention to it, as to a light shining in a dark place, until the Day dawns and the Morning Star arises in your hearts. ABOVE ALL, you must understand that NO prophecy of Scripture came about by the prophet’s own interpretation. For prophecy never had its origins in the will of man, but men spoke from God as they were carried along by the Holy Spirit. But there were false prophets among the people, just as there will be false teachers among you. They will secretly introduce destructive heresies, even denying the Sovereign Lord who bought them – bringing swift destruction on themselves. Many will follow their shameful ways and will bring the Way of Truth into disrepute." Peter was speaking of those who were bought with a price, those who were originally given understanding of the Way of Truth, but willingly listened to false teachers. And how destructive are the heresies of these false teachers! They even deny the First Lord of the Universe under the Father, the Mighty Christ who bought them and prepared them for Glory. But they turned away to lying fables only to await the swift destruction that will destroy them. And how they’ve brought the Way of Truth into disrepute! Their conduct has been absolutely shameful! And did they do it in ignorance? Did they set forth the falsity of their teachings in ignorance? They know all too well that they selectively chose their teachings to be acceptable to, and to conform to, an emotional form of worship; and they know very well that they dismissed anything they couldn’t understand. In their depraved minds they molded and shaped God and His Mighty Son to conform to their own image. What is so amusing about many of these people is, they never have an original opinion about anything. They’ve taken snippets of doctrine from the opinions of others and attempted to flange them together into some form of coherent doctrine that would be acceptable to others. And what did Peter say? He said, "ABOVE ALL, you must understand that NO prophecy of Scripture came about by the prophet’s own interpretation". There is only one ministry on earth that is teaching exactly what God has said, and every prophecy is linked to what God has written. Only the Levite Brotherhood, the Sons of Jerusalem, presently teach what God has written, and what is more, they believe God! So it’s an indictment against all those who have taken their own interpretations and have corrupted all that God has said. God made man in His own image. This would imply that not all intelligent beings are made in the image of God. God has a habit of describing certain beings as beasts, which typify what they are. The perfect example is Satan the devil. Created as a glorious and intelligent being, he is now a loathsome dragon – a detestable creature lacking any form of righteousness or godliness. He rebelled against his Father and was no longer fit to be called a son. It always amuses me to hear God’s enemies refuting Satan’s former status. They don’t blanche in the least to call themselves the sons of God (even though they are not, but flatter themselves with this illusion), but cannot conceive that since God created Satan, he is as much a son of God as Adam was; and Adam is called the son of God (Luke 3:38). And incidentally, Christ is called the last Adam (1Cor 15:45). Satan is God’s prodigal son, but he is quite unlike the prodigal son in the parable that Christ spoke. In the parable, the prodigal son left the father and went on his way to spend his fortune. When it was all spent, he humbled himself and vowed to return to his father and be treated as an unworthy servant. But the father who loved him saw him from a long way off, and welcomed him back, and said this: Luke 15:24 "For this son of mine was dead and is alive again, he was lost and is found." So which son does this parable represent? Whoever it is, he was both dead and lost prior to returning home. Well, God tells us who this son is! It’s Ephraim! Jer 31:7 "This is what the LORD says: "Sing with joy for Jacob; shout for the greatest of nations. Make your praises heard, and say, ‘O LORD, save your people, the remnant of Israel.’ See, I will bring them from the land of the north and gather them from the ends of the earth. Among them will be the blind and the lame, expectant mothers and women-in-labour; a great throng will return. They will come with weeping; they will pray as I bring them back. I will lead them beside streams of water on a level path where they will not stumble, because I am Israel’s Father, and Ephraim is my firstborn son." God goes on to say He will ransom them: V11 "For the LORD will ransom Jacob and redeem them from the hand of those stronger than they." This is the greatest of nations – now humiliated and ransomed by those who are stronger than they. God acknowledges Ephraim’s moaning and deep repentance: V18 "I have surely heard Ephraim’s moaning: ‘You disciplined me like an unruly calf, and I have been disciplined. Restore me, and I will return, because you are the LORD my God. After I strayed, I repented; after I came to understand, I beat my breast. I was ashamed and humiliated because I bore the disgrace of my youth.’ Is not Ephraim my dear son, the child in whom I delight? Though I often speak against him, I still remember him. Therefore my heart yearns for him; I have great compassion for him," declares the LORD." In V21 God speaks of Virgin Israel. God speaks of replanting the House of Israel and the House of Judah: V27 "The days are coming," declares the LORD, "when I will plant the House of Israel and the House of Judah with the offspring of men and animals. Just as I watched over them to uproot and tear down, and to overthrow, destroy and bring disaster, so I will watch over them to build and to plant," declares the LORD." This whole chapter of Isaiah is worthy of careful study, but let’s skip to V31 "The time is coming," declares the LORD, "when I will make a New Covenant with the House of Israel and with the House of Judah. It will not be like the Covenant I made with your forefathers when I took them by the hand to lead them out of Egypt, because they broke my Covenant, though I was a Husband to them," declares the LORD. "This is the Covenant that I will make with the House of Israel after that time," declares the LORD. "I will put my Law in their minds and write it on their hearts. I will be their God, and they will be my people." You’ll notice that after that time only the House of Israel is mentioned, not the House of Judah. Perhaps it was just an omission – or perhaps it wasn’t! Well, Ezekiel gives us more information: Eze 36:24 "For I will take you out of the nations; I will gather you from all the countries and bring you back into your own land. I will sprinkle water (the River of Life that flows from the threshold of the Temple) on you, and you will be clean; I will cleanse you from all your impurities and from all your idols. I will give you a new heart and put a new Spirit in you; I will remove from you your heart of stone and give you a heart of flesh. And I will put my Spirit in you and move you to follow my decrees and be careful to keep my Laws." And how does this all come about? Well, one thing that is certain is, it won’t happen overnight. Nevertheless, God began the planning process millennia ago. He instilled certain qualities in each of the 12 Tribes of Israel and determined some of the characteristics that would be evident in the endtime. These would manifest themselves along tribal lines, with some of the Tribes actively seeking to bless the Israelite nations, and others providing the means to curse them. In order to curse them, they would need to become like Gentiles and favour Satan’s brood, and to whittle away at the mighty power of God’s son Ephraim. They’ll favour Satan’s ways of multi-culturalism, and turning the world into ‘coffee-coloured people by the score’ (as the old song goes). They’ll hold to the view that with a little creative reasoning everyone will seek peace and live happily ever after. They’ll even go so far as to suggest that it’s all the fault of the Western nations for being rich and not doing enough to help the poorer nations. And all the time they’ll be steering hatred and venom towards the U.S. for being the major culprit. In short, they’ll accuse the only nation who has never sought to build an empire, or colonize poorer nations, or exploit any other nation either economically or politically. And they’ll accuse them of aggression. What will be notably absent from their arguments is any detail of their own Tribes historical past. The French and the Canadians are towering examples of this type of hypocrisy. And what were God’s instructions concerning this? Deut 27:9 "Then Moses and the priests, who are Levites, said to all Israel, "Be silent, O Israel, and listen! You have now become the people of the LORD your God. Obey the LORD your God and follow His Commandments and decrees that I give you today." On the same day Moses commanded the people: When you have crossed the Jordan, these Tribes shall stand on Mount Gerizim to bless the people: Simeon, Levi, Judah, Issachar, Joseph and Benjamin. And these Tribes shall stand on Mount Ebal to pronounce curses: Reuben, Gad, Asher, Zebulon, Dan and Naphtali." What does this mean? Was this all just a pointless exercise in futility? Or is God telling us something? On the day the Tribes of Israel truly became the people of God, when the time came to enter the Promised Land, God identifies those who will bless the People of God and those who will curse them. Of particular interest is Simeon (Germany) who will bless the people. Of equal note is Reuben (France) who will curse the people. Both Simeon (Germany) and Reuben (France) head these lists for blessings and for curses and it’s no coincidence! As we rack up the final days before all hell breaks loose, God has made it clear who will stand with Him when the crunch comes. It’s preordained which Tribes will arise to the occasion, and which will curse Israel in favour of God’s enemies. You will notice that this division is becoming clearer every day. The self-righteous French have become clearly delineated for what they are – even in the news services commentary, and it seems every opinion is against them. They oppose the U.S. in everything, and openly favour the Islamic nations. Their appalling arrogance has blinded them. You’re going to hear a lot about the French as they continue to lead half the Tribes of Israel astray. Worthy of note is the fact that after the Israelites had separated into two groups on their respective mountains, it was the Levites who spoke aloud the first warnings to the House of Israel (V14). A clear understanding of what the Covenant was all about followed this, and continues through the chapters Deut 28, 29,30. While this happened nearly 3½ millennia ago, God has been steering the Tribes of Israel to their final destination – the Promised Land. He knows the characteristics that He has embedded in each of them. As it turns out, this chapter of Deuteronomy is the very chapter the Gentiles referenced in their fanciful, doctored book of Galatians in chapter 3. They suggest the curses have been removed, and that Christ has become the curse. You will notice in most Bible margins that this is a reference to Deut 27. You will also notice that their agenda was twofold. Firstly, they wanted to divest themselves of God’s Law and institute their own church laws and rigorously enforce them on pain of death – even on the innocent. Secondly, they wanted to form their own priesthood and divest themselves of the Levitical Priesthood. History has shown us what their priesthood is like, and why they hated the Levites for their warnings! They suggest that Christ became the curse, and so they were free to do as they please. The rest of Deut 27 tells us what they desired so badly, and why they divested themselves of any recognition of these curses. The very first warning illustrates their rampant disregard for God’s instructions: Deut 27:15 "Cursed is the man who carves an image or casts an idol – a thing detestable to the LORD, the work of the craftsman’s hands – and sets it up in secret. Then all the people shall say "Amen!" If there is anything that typifies Gentile Christianity it’s their propensity to worship idols. By claiming that Christ became the curse, they consider themselves to be free to worship idols as often as they please. The next eleven verses deals predominantly with sexual exploitation, and how the Gentile priesthood loves this! They chose a life of celibacy (wink, wink), but their history shows they were anything but celibate. Their lifestyle was a smorgasbord of wanton sexual misbehaviour. Homosexuals loved it and quickly gravitated to the priesthood. In the past, Gentile Christianity killed those who opposed them and these verses have something to say about this too. In time, they developed the propensity to worship each other. They developed lists of hundreds of ‘saints’ to replace Jesus as the Mediator between God and man. Paul certainly wrote to the Galatians, but he never wrote this book, that which the Gentiles decided to canonize. It is blasphemous and demeaning to God, and refutes all that God has said. If you read the book of Galatians, you will note the attempt to steer people away from the House of Israel in favour of Gentile Christianity, and they even claim to be descendants of Abraham (Gal 3:8). Gentiles are not Israelites, nor are they descendants of Abraham. Some hold a tenuous position among the Israelites provided they obey all God’s Laws, only then will they be privileged to be grafted into the tree. The Gentiles claim in this spurious fabrication that God doesn’t give His Spirit to those who obey Him (see how they contradict what Peter said in Acts 5:32) but only to those who believe what they heard (3:2). It’s a rather interesting comment from those who so denigrate the words of Deut 27 since God spells it out so plainly: V26 "Cursed is the man who does not uphold the words of this Law by carrying them out." And in the next verse: Deut 28:1 "If you fully obey the LORD your God and carefully follow all His Commands that I give you today, the LORD your God will set you high above all the nations on earth." It might be suggested that the Israelites never achieved this, and this would be true. They failed to fully obey the LORD their God! But in complete contrast, the Gentiles refused to obey God. They would have none of it! They insisted their followers believe what they heard – through them – and not obey the Laws of God! And they even insisted that Christ was God’s curse in their stead because He was hung on a tree. And who was it that hung Him on a tree? Was it God? Twice, the faithful Shepherd Peter told his accusers who it was that hung Him on a tree: Acts 5:29 "Peter and the other Apostles replied: "We must obey God rather than men! The God of our fathers raised Jesus from the dead – whom you had killed by hanging Him on a tree. God exalted Him to His own right hand as Prince and Saviour that He might give repentance and forgiveness of sins to Israel. We are witnesses of these things, and so is the Holy Spirit, whom God has given to those who obey Him." Take note of when God exalted Him as Prince and Saviour to Israel! It was after He was raised from the dead! Peter raised the question of who hung Jesus on a tree a little later after his vision of the detestable animals and creatures. God identified these detestable animals as Gentiles and then instructed Peter not to consider unclean any who obey God. This is Peter’s account to Cornelius: Acts 10:34 "I now realize how true it is that God does not show favouritism but accepts men from every nation who fear Him and do what is right. This is the message that God sent to the people of Israel, telling the good news of peace through Jesus Christ, who is Lord of all. You know what happened throughout Judea, beginning in Galilee after the baptism that John preached – how God anointed Jesus of Nazareth with the Holy Spirit and Power, and how He went around doing good and healing all who were under the power of the devil, because God was with Him. We are witnesses of everything He did in the country of the Jews and in Jerusalem. They killed Him by hanging Him on a tree, but God raised Him from the dead on the third day and caused Him to be seen. He was not seen by all the people, but by witnesses whom God had already chosen – by us who ate and drank with Him after He rose from the dead." So what happened beginning in Galilee after the baptism that John preached? God anointed Jesus of Nazareth with the Holy Spirit and Power. Everyone knows how the Holy Spirit descended on Jesus just like a dove, and God said, "This is my Beloved Son in whom I am well-pleased." Jesus was born with the Holy Spirit just as John the Baptist was, but this was a special addition, and the same Spirit that God would later send in Christ’s Name. Those who receive it are witnesses whom God has chosen in advance, in the same manner as the Apostles. One thing you will notice in what Peter wrote here is that he didn’t become emotionally unstable as many Christians love to do today. They seem to think that becoming sickening in their emotional instability is a manifestation of God’s Holy Spirit. People who carry on like emotional fools are under the power of the devil! This is the term used by Peter. The devil wants those under his power to present doctrine that makes God look childish and foolish. They want to convey the impression that God is sitting around listening to their emotional clambake and sending His Holy Spirit to make them foam at the mouth and lose consciousness. The fact is there is nothing more obnoxious to God than seeing people willingly putting themselves under the power of the devil and acting like lunatics. God would never populate His Kingdom with such pretenders. Those who are under the power of the devil are worthless and useless for the Kingdom of God. Can you imagine kings and priests in God’s Kingdom acting as these fools do? There is nothing more obnoxious to God (and to me) to see support given to God’s enemies. In fact, double-minded, unstable people have no future at all! Faithfulness to God requires more than acquiescing to some form of emotional propaganda; it requires faithful devotion to all the principles that God has laid down. It requires unswerving devotion to everything God has said, and it also requires the defending of God’s Way as being right and honourable. Most people are not interested in defending God’s reputation. Now if their mother or father were insulted, then perhaps they would defend them, but to defend their Heavenly Father? Forget it! All too often they become apologists for God and paper over all God’s faults as they see them. And apparently, they see plenty of faults with Almighty God. Not surprisingly, God uses the same measure against them as they’ve used against Him. 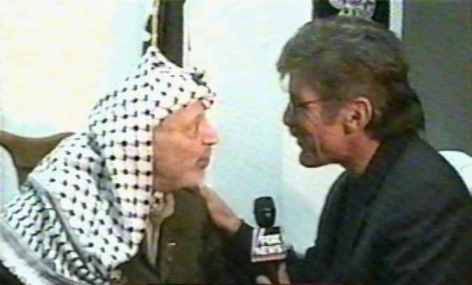 Geraldo Riviera (Fox News) becomes unhinged on camera and gets all touchy-feely with Arafat. It was a study in rampant emotional instability where Geraldo was totally blinded to Arafat’s mindless and murderous terrorism. Geraldo has chosen to ignore the evidence that links Arafat to indiscriminate homicide bombers against Israelis, and the madness of Moslems in general. Geraldo became so emotionally deranged that it appeared as if he was about to kiss the little frog demon. Immediately afterwards, Geraldo said that if an election were held today, ‘president’ Arafat would be elected with a 95% majority. This indicates that 95% of all Palestinians have a terrorist mentality. If they’re all murderous terrorists, then none of them deserve to live! Thanks to Geraldo for pointing this out, even though his objective was to mitigate in their favour. One of the great ironies of human conduct is the way people can be so deceived by outward appearances. And even more ironic is how some people like to masquerade as servants of righteousness while totally rejecting God’s Way. 2Cor 11:13 "For such men are false apostles, deceitful workmen, masquerading as apostles of Christ. And no wonder, for Satan himself masquerades as an angel of light. It is not surprising, then, if his servants masquerade as servants of righteousness. Their end will be what their actions deserve." Unfortunately, most people don’t know how to recognize a masquerade, and Satan’s false apostles and deceitful workmen are very good at it. Paul, of course, was speaking of the vipers who were infiltrating the Church. But Satan’s deceitful workmen masquerade at all levels, and they easily deceive all those who are untrained in detecting Satan’s cunning. Placed in this situation, many people overlook overwhelming evidence of spiritual misconduct, and outright evil, because of a few well-chosen words and some convincing play-acting. 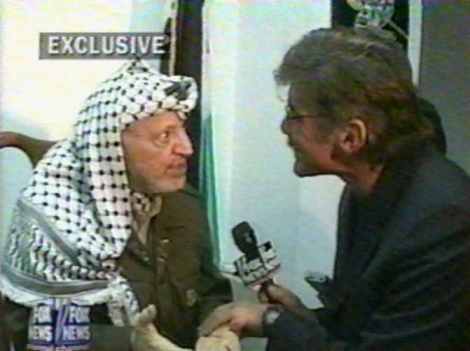 You may recall Geraldo Rivera’s interview of Yasser Arafat. At the time, Arafat was knee-deep in the blood of hundreds of innocent Israelis in some of the worst ever homicide bombings. Enter our hero Geraldo, and in a split second he becomes a sycophant! It was embarrassing to watch him being hypnotized and beguiled by this creature. I don’t expect Fox News will show too many reruns of it. Geraldo was totally unhinged! Of all the Christians (so-called) in the world, God chose to place His Spirit in the Church reestablished by the shepherd He called for this purpose – and no other Church! Anyone who thinks otherwise is deluding himself. Christ plainly said that the Church He established would never have the gates of hell prevail against it. It’s quite obvious that all mainstream Christian Churches have failed in the most menial of doctrines to adhere to the teachings of Christ. God requires of His Church for them to be obedient to His Commandments, and to observe His Holy Days – and this as a bare minimum! Christ said that when one has done all that is required of Him they would be classified as unprofitable servants. And all those who fail to observe God’s requirements are not even servants. It should be pointed out that when the flood comes, the people will know nothing until it sweeps them away (Matt 24:39). The majority will be as bereft of the Holy Spirit as they are today. Since this is so, it’s incumbent upon everyone to decide whether to serve God faithfully or not! And Almighty God makes it clear that He doesn’t depend on your service either way. But He is about to show that your very existence depends on Him, and so does your survival and/or resurrection.